Nashville, TN - The Tennessee State Museum was packed with family, friends, Country Music stars, athletes, actors, Gospel Music legends and young Pop icons all gathering to celebrate the art of Oak Ridge Boy, William Lee Golden. 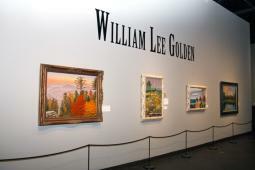 A private reception was held for the William Lee Golden Art Exhibition on June 8, 2010 during the international CMA Week festivities. The Oak Ridge Boys were there to support their partner and sang four songs during the evening. Attendees included: Financial Specialist; Dave Ramsey, Gospel Music Icon; Bill Gaither, Country Music legends Charley Pride, TG Sheppard, Lynn Anderson as well as Gold Medalist; Scott Hamilton, Kelly Lang, Michael English, Bo Bice, Two Foot Fred and many more diverse entertainers.